HMY Britannia left for her last tour of various ports from Portsmouth before being paid off on 11th December 1997. She had been in service 43 years and for all that time she was based in Portsmouth. She has played key roles in many events and just her being present takes the pride of Britain to where ever she is. The gleam of Britannia's hull was maintained by dry docking her every six months and painting her. She was given eight coats of paint. There would have to be a line of men painting as the hull had to dry all at once to stop streaks and give her the reflective finish which she has. The gold band round her is real gold leaf and had to be applied each time. 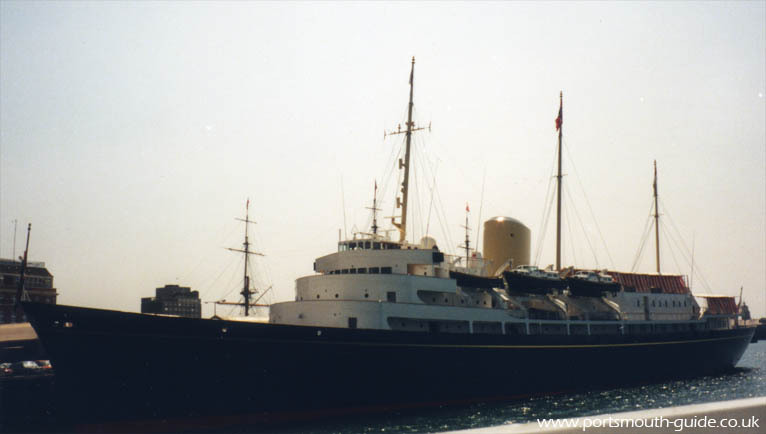 HMY Britannia's displacement was 3,990 tons with a light load and 4,961 with a full load. She was 125.7 x 16.8 x 5.2 metres. She had a speed of 21 knots, a compliment of 277 crew and had a range of 3,675 at 14 knots or 2,800 at 20 knots. The above picture was taken of HMY Britannia berthed alongside Railway Jetty in Portsmouth Harbour. This section has been split into different pages as there is so much to include to do with Britannia and her association with Portsmouth her home port for 43 years.